FERNANDO - How many slaves are you going to bring me? Are you sure that India is around here? NATIVE - Who do you call Indian? COLÓN - Ñeñeñe, I dye you, I dye you ... Go on, man. Do you have followers? Have you built a statue? Do you have a holiday with your name, or something? Come on, man ... Erik El Rojo ... Erik El Rojo ... Ñeñeñe ... I dye you, I dye you ... THAT COLONISO!. Estamos Escuchando Te Coloniso (feat. Beauty Brain) de PlayGround Fire con letra en este video de música online con en el video clip con estilo Latina y editado en (2018) e incluido en el disco ''Singles''. 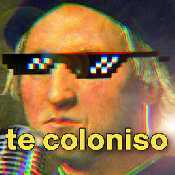 El tema "Te Coloniso (feat. Beauty Brain)" es el mas escuchado del CD donde puedes ver su letra y las canciones Top "Te Coloniso (feat. Beauty Brain)" ,"Velaske, Yo Soi Guapa? (Las Meninas Trap Mix) (feat. Christian Flores)" ,"Pretty Things" ,.